Ben Taylor is from Albuquerque, New Mexico and has been improvising since 2008. He started improvising as a part of Atlas Improv Co. in Madison, Wisconsin when he was an undergrad. He performed, instructed, coached, and led communication workshops with Atlas for 7 years. 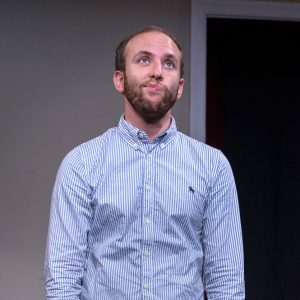 He moved to DC in 2016, and was immediately drawn to the Washington Improv Theater’s confident, patient, and playful level of performance. He’s happy to be here. Offstage, Ben coordinates youth programming at the National Museum of Natural History. He loves insects so, so much, and it’s a thrill to work in a place that houses literally millions of them. Ben likes to draw comics, listen to noise music, and cry during Pixar films. Let’s build the best world possible, one scene at a time. Ben has been teaching improv since 2010, and it is one of his all-time favorite things to do on planet Earth, just behind eating. Improv allows a total gift in letting you squeeze the insanity out of the normal, grounded interactions we have every day, and Ben is thrilled to share that gift with anyone and everyone. He vows to provide a safe and fun space for everyone to learn, to make sure more playing is done by you than talking by him, and to respond to your emails within 24 hours. You can bank on it. Ben started improvising in Madison, Wisconsin in 2008. He moved to DC in 2016 and went through the WIT curriculum shortly thereafter, getting onto the Harold team Richie in 2017. He is the current coach of Wonder Whale. He is the future teacher of you, dear reader. More things for you to bank on.